CVs are daunting. Whether you’re writing yours for the first time or revisiting one again after gaining more qualifications, it can be an anxious experience. It pays to get used to it, though, as the average millennial will have between 15-20 jobs in their lives, so it’s something you’ll be doing a lot. Here at Oxford Learning College we’ve already written about how to write the perfect CV, but we thought it needed developing on. After all, a CV that ticks all the boxes may not be enough for some jobs and what is needed is how to really stand out from the crowd. Start off by spending time dissecting the job description – really drill down into what do they want. And ensure you tick every box, meaning you have made it clear you have studied or have experience in each area they require. The recruiter’s eye will naturally fall somewhere between the top and middle of the first page of your CV – therefore it’s critical that this area contains the most important information. The language you use is your power in your CV. Using positive words such as achieved, organised, involved, developed and created give the best possible impression. If you can state what you have achieved in each position you’ve held, all the better. It’s worth either having a life skill section to your CV or including it in a cover email. This could help you stand out from the crowd and give the recruiter an insight into what you’d be like to work with. Consider experiences such as: Have you travelled? Do you speak another language, have an interesting hobby or are highly computer-literate? Do you have any significant sporting accomplishments? Have you studied while working or attended any short training courses? Have you done any charity work? The idea here is you sound interesting and bring to the company other skills that can be beneficial that show you amount to more than your work experience and qualifications. There are two types of education. The first is obviously GCSEs, A Levels, Degrees and Masters. These show an employer you have a capability to learn to a specific level. The second type of study is courses that are more like training; these equip you to be able to do something with that learnt knowledge. Ensure you have both types of education on your CV. Don’t Fit the Job Description Perfectly? Not the perfect candidate and don’t tick all the boxes in the job specification but want the job? Don’t fret. Sometimes an eager and earnest explanation can do the trick: state that you’re not deluded, you’re aware you have a shortfall in a specific area, yet you have enrolled in a distance learning course and are developing yourself or you feel sure you’ll be up to speed in a short time. What if you spent a little too much time doing very little while deciding what to do with your life? Try not to have any gaping holes in your CV or, if there are gaps, ensure you’ve accounted for them. Fill time with charity work, self-development short courses, work experience, travel or education. However, never lie on your CV. Changing your grades would be classed as fraud and could be punishable with a prison sentence! When it comes to references, if you have worked for anyone well known or in a high position, ask them for a short quote on you and add this at the end of your CV. It doesn’t take up much space but it will make you stand out from other candidates as it’s like a recommendation. The references usually sit at the end of a CV but if you’ve got a wonderful quote from someone respectable perhaps lead with it – that’s bound to get the recruiter’s attention. This one’s actually more about the process of applying for a job, rather than a CV hack, per se. Some – actually, most – organisations say that all recruitment must go through their Human Resources department. However, you need to know that this isn’t always the case. If you want to work in a specific department in an organisation, then find out the manager’s name and try to contact them in a personable way. They might refer you back to HR officially, but there’s nothing like the line manager of the job that is available saying they like you to improve your chances of getting hired. Keep reiterating what can you do for this team/business not what can they do for you. Especially in your early years of the career ladder people expect you to be competent but a willingness to learn and fit into the company culture is important. Arrogance rarely gets people jobs. 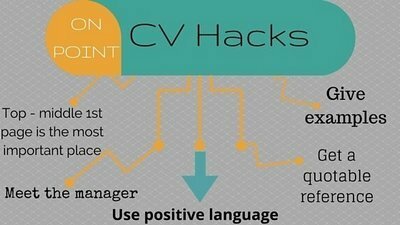 Like our pick of CV hacks? Check out the words you absolutely must NOT use on your CV.